Google has just announced its second quarter earnings for 2010. Of note, revenue stood at $6.82 billion, which is an increase of 24% year-over-year. But this only represents an increase of 1% over Q1 2010. Google has a history of seeing small growth from Q1 to Q2, however. More interesting may be that net income actually fell in Q2 versus Q1 of this year. A big reason for that is likely because paid clicks fell by 3% from quarter to quarter. 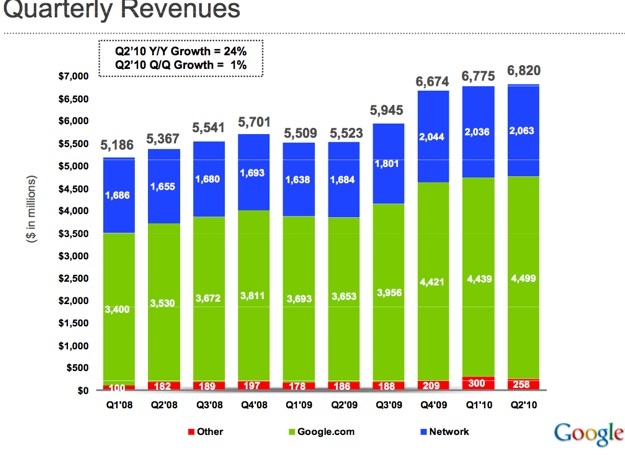 Another factor is that network revenues (those off of Google.com) fell by 1% this quarter compared to last quarter. Non-GAAP EPS was 6.45, below the consensus estmate of $6.52. All that said, Google now has $30.1 billion in cash, cash equivalents, and short-term securities — which is up nearly $4 billion from last quarter. Google also has about a thousand more employees now (21,805 full-time) versus what it had a quarter ago. – We noticed that more and more traditional brand advertisers are embracing ways to expand their brands online. Like P&G. – Campaigns across display, mobile, and search — it’s all being integrated. – Growth in display was very strong. Display network includes YouTube — it’s growing rapidly. – YouTube is seeing impressive growth with regard to ads. – Very pleased with courts decision to rule in our favor for Viacom case. – We invested $100 million to win this case. – Mobile ads continue to grow. And now AdMob is here. – 160,000 Android devices activated daily — 2 every second. – The world is moving into the cloud. – After Q3 we won’t recognize the sales from Nexus One — as we announced, we’re stopping selling them. – International revenue is 52% of our revenue. – And we’ve had a bunch of UI and UX updates. – When you search from your phone, you’re much more likely to click if they have a clickable address in them. – Display is going really well. The ultimate goal is to designate a particular audience on our network. – And we’re doing remarketing. – Android is a leading example of being open. Most of these devices are developed independent of Google. – Android Market now has around 70,000 apps — up from 30,000 in April. – People spent 4.8 million hours playing Pac-Man on our main site when it was up. Q: Were bonuses a part of operating expenses? A: That had a small impact. It was about headcount, marketing and acquisitions. Q: How much of paid click is coming from mobile? A: Mobile is growing faster than other clicks. There is a larger range of mobile clicks, but we don’t detail. Q: Where are the headcount increases coming from? A: It’s 1,200 new people, but 300 are from M&A. Most of the headcount is in engineering and sales. It’s in the four core areas: search, mobile, apps, display. Q: CPC mobile vs. desktop. A: Not really enough data yet to say. It’s really a different beast. Q: How much investment is going into Android? Is it all just to compete? You’re not charging for it, how do you monetize it? A: Android cost isn’t material for the company. Some of the key products have not been developed by Google at all — like the Droid X. The entire ecosystem is exploding. JR: I think the most important thing beyond the growth is that the most popular app is a browser. What do they do there? They search more than they ever have. A: Android search grew 300% in the first half of 2010. It’s exploding. Mobile has grown 500% in the last 2 years in traffic. Android is an accelerator of that. Q: How’s the macro environment going? A: For Google it has been a great quarter. There has been no impact from the larger economy problems. We’re really pleased. Cash breakdown is 50/50 U.S. vs. International. Q: Returning cash to shareholders? A: Commercial paper is a great opportunity for us. We have made no decision about share buybacks. It’s a topic that is regularly debated, but nothing to announce. Q: Android and mobile is a defensive strategy? A: We did it for offensive reasons, not defensive reasons. We think an open ecosystem is incredible important. And we know that smartphones create a new set of activities for search and transaction. It’s both defensive and offensive. Q: Android ecosystem support is less than what some would like. A: We’re investing heavily. Search advertising is nascent in this space. And we’re doing a lot of innovation in cloud computing in other. A: We don’t comment on YouTube. But we are incredibly pleased by its trajectory. It’s 2 billion views per day. It’s a billion monetization views a week. Q: Talk about Android and Chrome OS in terms of revenue. Is there any in the software? A: It’s too early to answer that. We’re mostly focused on building out the platform with Android. With Chrome, it’s still too early. A: Contextual search losing market share? Q: There has been a lot of debate for people’s methodologies. Be cautious about those numbers. Q: Do you feel you’re losing market share? Q: Update on China? Are they okay with the new method? A: The good news is we have our license renewal. Revenue from China is not material from our revenue though. We had decent revenues for Q2 though. I hope you understand why I won’t talk more about it.